I’m not going to lie. I was scared of facing the Eastern States 100 course. 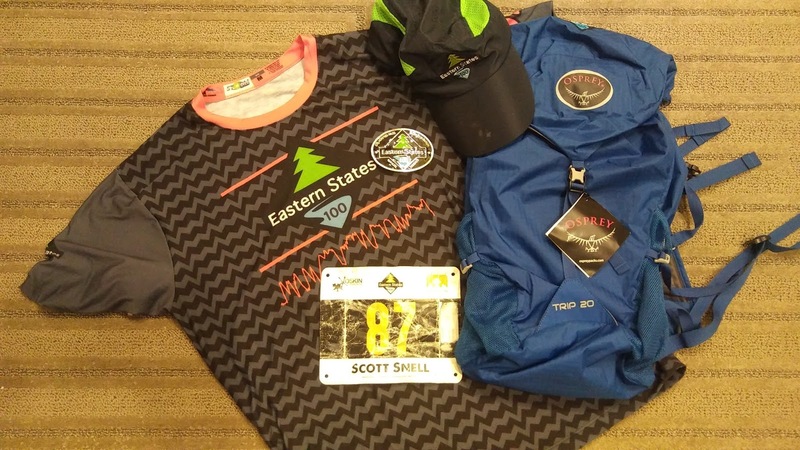 It was less than a year ago that I ran my first 100 miler (TARC 100) for the primary purpose of overcoming my fear of the 100 mile distance in order to begin working on my goal of completing the 2017 Pennsylvania Triple Crown Series with some semblance of confidence. That first 100 miler went well, far better than I had hoped it would. 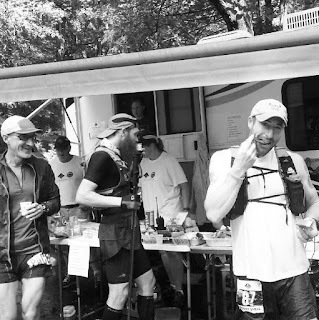 I had the confidence from my first 100 miler going damn near perfectly driving me up until Worlds End 100k (the second race of the three race series) where things got a little rough. At a low point during that 100k I began to question my resolve to finish the series. After the race, I tried my best to focus on the positives that came out of the experience: overcoming rough patches during a long race, having a realistic nutrition plan, and realizing in the moment that highs and lows are both temporary. Try as I might to concentrate on the positives, during the entire training period between Worlds End and Eastern States I couldn’t quite manage to get that little pessimistic voice in my head to completely shut up. Honestly though, that annoying little voice had a convincing argument. The argument was something along the lines of “You may have done a hundred miler, but you’ve never done a tough hundred miler with 20,000 feet of elevation gain and technical trails like Eastern States. Hell, Worlds End 100k nearly broke you with 12,000 feet of gain. Not to mention, you’ve only done one 100 miler that just happened to go well. How do you know that wasn’t just a fluke?” Needless to say, it wasn’t the most enjoyable training block I’ve ever submitted myself to. However, in a way that voice was more motivating than any kind of positive reinforcement could be. The motivation to prove it wrong drove me to train for Eastern States and run the course as best I could even if I wasn’t sure I would make it to the finish. Arriving at the bib and packet pick up at Little Pine Little Pine State Park the evening before the race made my head start to spin. It all kind of felt surreal in a way. It wasn’t the nervous excitement that I’ve felt before other races. It felt like I was on the precipice of completing a major journey. The thought had crossed my mind to attempt the PA Triple Crown Series in 2016. However, I did not have the qualifying races required to register for Eastern States until after all the spots had been filled. So, I spent 2016 preparing. Now I was only a few hours and 102.9 miles away from completing the goal I had set for myself nearly two years ago. It was all a bit overwhelming. Thankfully, my wife and two boys had made the trip with me to camp for the weekend while I ran. That helped me bring it all back into perspective and realize that whatever importance or value I had attached to this goal was just that: the value I assigned to it. No matter how the race went; I would still be the same dad and husband to them, I would still go back to the same job next week, and most people in my daily life would have no clue about it. Maybe I was using this thinking as a bit of a mental strategy and to keep my head from spinning. 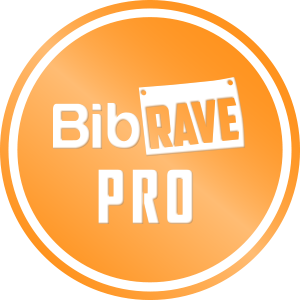 Based on training runs and past races, I’ve found a little apathy can do wonders. Just after bib pick up at the start/finish area. After setting up our tent and letting the boys play in the water for a bit we settled down for the night. I went through my gear and made sure everything was ready for the morning. Then I went through the schwag bag to be seriously impressed with how much quality stuff was in it. Let’s start with the bag itself. It was an Osprey brand pack that looks like it is water resistant and perfect for doing some fastpacking adventures. Inside was a pair of wool socks, a running hat, and running shirt. It was far more than I expected for schwag, but then again Eastern States pretty much goes above and beyond expectations in every department. It felt like my alarm went off early, but even with the 5 AM start time I still managed to get a good six hours of sleep. I crawled out of my sleeping bag, threw my clothes and gear on, and said my silent goodbyes to my family before making my way to the starting area. I hopped into the weigh in line and made it through then hopped into the bathroom line and dropped a healthy deuce before heading to the starting line with just a couple minutes to spare. This was a huge mental boost for me. It felt like my body told me it was ready for what lies ahead. The waste was excreted, now it was time to move. The timing was nearly perfect. Shortly after arriving at the starting line, we had the countdown and the race was off with the sound of people cheering, bells ringing, and hoots and hollers. Then a minute later it got extremely quiet and a dichotomy of ultras hit me. The fact that so much energy is felt at the start, finish, and at certain aid stations contrasts so dramatically with the majority of the time running an ultra where (at least in my experience) I am usually alone and for the most part hearing only the wind and my footsteps. It was an interesting thought at the time, and I may have given it more depth than it deserved for the mere fact that my mind needed a distraction away from thinking about what I was about to force my body to endure. With that distraction on my mind, I jogged along the paved road (which was the majority, if not the only paved section of the course) to the campground before we hit a bottleneck at the trailhead and the start of the single track. It wasn’t long after hitting the single track that we arrived at the first big climb of the course. I took it easy and reminded myself that there was no reason to push hard this early; the course will provide plenty of opportunities to blow your quads up later. Either during or not long after that climb the sun started to rise and my headlamp was no longer necessary. I arrived at the first aid station feeling good and fresh. I filled my Paw Patrol and TMNT bottles, ate a gel and packed one for between aid stations, and grabbed a few bites of food before moving on. I was surprised to see it, but they also had an entire gum section at this aid station. Maybe it was just because I hadn’t brushed my teeth that morning, but gum sounded surprisingly refreshing so I grabbed a piece to chew on as I left. I made my way along the trail with the mindset of enjoying the day. If I don’t enjoy it, what’s the point? The sights and smells were great and I got into a flow knowing that I would get to see my wife and kids at AS3 (Lower Pine, mile 17.8). Just before AS2 a few runners and myself got to see a black bear that we scared off of the trail, no big deal after working at Shenandoah National Park for a summer. Otherwise, that stretch of the course was uneventful. Arriving at AS3 and seeing my boys rejuvenated and gave me a much greater boost than I was expecting. Their excitement was real and I felt it. 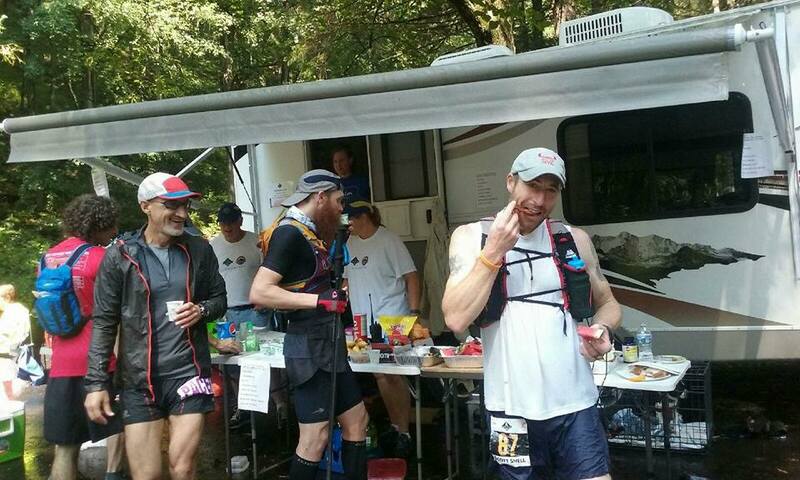 I continued my plan of eating some real food and a gel at each aid station and packing a gel to go and continued on. Lower Pine AS3, Mile 17.8. Soon after leaving the aid station, the course follows a gravel road up a good stretch of an easy, but sustained climb. Some were hiking it, but I was feeling good and decided to jog this not so steep and non-technical climb. The next event of note did not occur until between AS5 (mile 31.6) and AS6 (mile 38.5). Somewhere during this stretch the rain that was forecasted for the day showed up. It was short lived, but the rain was heavy and soaked everything. I believe it was also during this stretch that I attempted to make a creek crossing without getting my feet wet by balancing across a slick log. I knew it was a bad idea and it ended with me standing in the creek telling myself that. Suffice to say, the rain didn’t soak anything that wasn’t already wet. Soggy, but in good spirits, I rolled into Ritchie Rd (AS6). I ate more there than at previous aid stations making my way from one side of the aid station table to the other. It was there that I had my first perogi of the day. It was delicious and and mashed potato perogies would become my staple for the rest of the day. Shortly after leaving this aid station the course follows a powerline cut for a gradual climb. It was somewhere at this point that I had to hop off of trail to take care of some business. Once my GI stuff was resolved, this non-technical section felt easy. Other than a few mud puddles due to the earlier heavy downpour, this stretch of the course was cake. 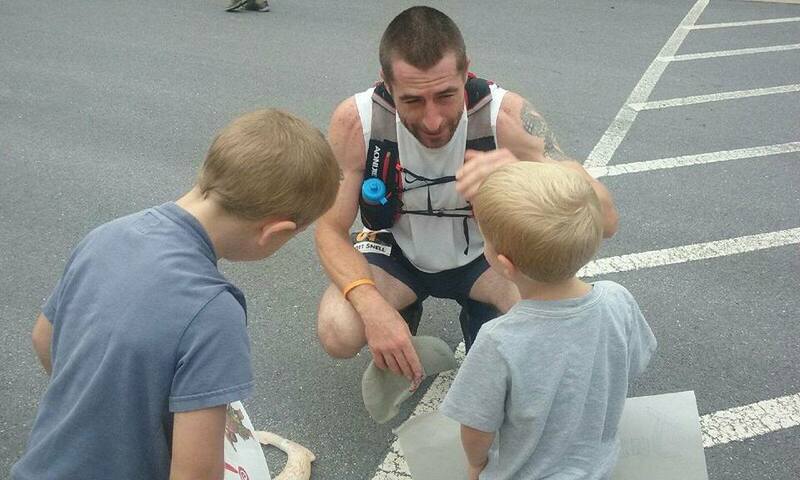 In addition, I had the fact that my wife and kids were waiting for me at the next aid station to spur me on. I arrived at AS7, Hyner Run (mile 43.2), in what felt like a flash. I ate a buttload of bacon and watermelon then shared some Swedish Fish with my three year old son. Up to this point I hadn’t given place much thought. I was paying attention to my pace mainly to see if I was going to be keeping my wife waiting at the aid stations for me. The pace and aid station arrival times I had given her were based on a best case, perfect day scenario of a 25 hour finish. Surprisingly, I was surpassing those splits at this point. Looking at past results, I expected a sub 25 hour finish to easily be a top 20 place finish. I was shocked when she told me that I was in 38th place at that point. I wasn’t disappointed, but more excited. My initial thought when I heard that was “a new course record will be set today”. Hyner Run AS7, Mile 43.2, where I feasted on bacon. With that somewhat bittersweet news, I continued on to the next aid station which I expected to be a water only aid station. Upon arrival, it was anything but. They had perogies there. 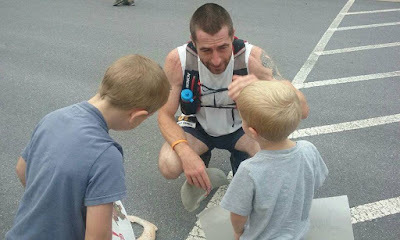 I ate my fill and continued on to AS9, Halfway House (mile 54.7), where I saw my wife and boys for the last time before the finish. There was one additional aid station for spectators, but I would arrive there too late for my wife to bring the boys there. She had to take them back to camp and get them to bed. With the sun beginning to set at the time, I said my goodbyes and thanked my wife for being so supportive. The inspiration that kids bring is irrational. I moved on and focused on covering the distance. My goal was to continue to take the course on in sections. 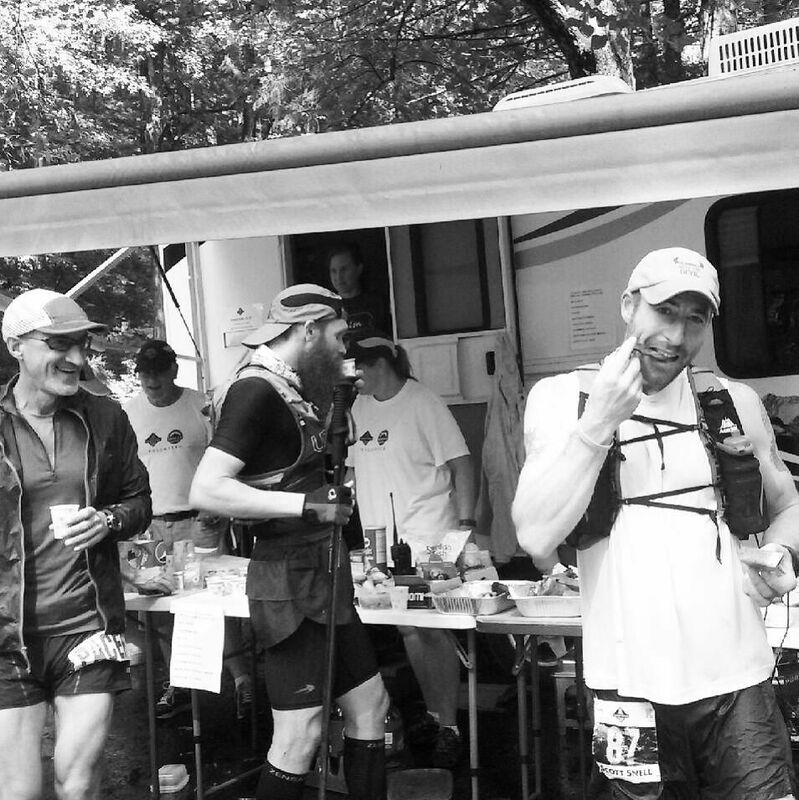 At every aid station I would ask how far it was to the next and then focus on making it there. To assist that goal, every aid station had a print out posted of the distance and elevation profile from the current aid station to the next. Mad props to the race director for that. This strategy worked great for me. I covered miles without thinking about the majority of the remaining distance I had to cover. It wasn’t until AS12 that I got my next surprise. At the Alegrines (mile 62.9) aid station they were recording and posting runners’ places and arrival times. The last I had heard from my wife at the halfway point was that I was in 38th place. 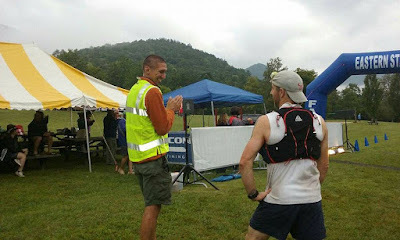 At this aid station, while I was casually eating a grilled cheese sandwich, they announced that I was in 16th place! How that happened, I have no clue. It scared me more than it motivated me. But I continued on just hoping that I could at least make it to the finish with a top 20 spot. 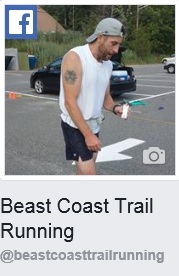 I ran on and shortly before reaching the next aid station (Long Branch, mile 75.6) I came upon another runner. It was dark, and it felt like I came upon the light that I had seen in the distance rather quickly. I intended to give my standard kudos to the guy and continue on my way until I was about to pass him. Then I realized how badly he was shivering and when he finally turned his head and made eye contact with me I saw a fear in his eyes. I tried to motivate him letting him know that it was less than a mile to the next aid station. His response was “Yeah, I’ve been telling myself that.” I kicked myself for not carrying the emergency blanket that was included with my hydration vest. When I bought it I thought “emergency blanket? Emergency whistle? When will I ever need these?” I told him I would hurry to reach the next aid station and let them know he was on his way and could use some help. Shortly after I arrived there and informed them of the situation they had a runner on his way with a jacket to assist. Not carrying emergency equipment is a general mistake. My real first race mistake didn’t come until AS14 (Blackwell, mile 80.3). It was at this point that I had left my one and only drop bag for myself with dry shoes and fresh socks. I had had wet feet since around mile 30 and they didn’t feel that bad. I went off of feel and the philosophy that if your feet feel ok don’t worry about them. I turned away the super helpful volunteer who offered me my drop bag saying that I wouldn’t need it. Later I would regret that. I drank some coffee and ate a piece of pizza then continued on. Shortly after, I jumped over a rattlesnake that was just on the edge of the trail rattling at mel. Then I hit a super technical and super slick rocky descent. Somewhere around this point I realized how bad my feet felt and my second to pinky toe (ring toe?) nail flipped back. It hurt and I told myself that it would make the last 20 miles interesting. I made it to the next aid station and that is when my head totally messed with me. I was at Sky Top (AS15, mile 84.8) where they provided some of the best care that I had received all day. I got soup with a pierogi in it. They changed my headlamp batteries and gave me spare batteries. I got Vaseline for the chafing under my armpits. But for some reason, I left thinking that I had six miles to the next aid station then four miles to the finish. In reality I had eight miles to the next aid station, then six miles to the final aid station, then four miles to the finish. It was only a difference of eight miles,but it seemed like an infinite distance at the time that I realized the mileage wasn’t adding up after leaving Sky Top. And with that realization my body began to let me know how much everything else was hurting. My feet were soaked and blistered. My armpits and crotch were badly chafed. It had taken me 80 some miles to get there, but I had reached my lowest point of the race. I finally reached the next aid station at Barrens (mile 92.8), but I was in such a funk mentally and my body was hurting so bad that I didn’t want to eat anything. I was sick of gels and I was sick of everything sweet. I forced myself to drink some coke and continued on with my negative mantra of “everything hurts”. Thankfully, between Barrens and the final aid station the sun came up. This was something that I had been looking forward to. I had never done a race before where I had run all night and I got to see the sunrise. It was motivating to have daylight break and turn my headlamp off. With that bit of motivation, I continued on to the final aid station even though my feet said no. I reached the final aid station (Hackettes, mile 99.1) and passed through quickly eager to reach the finish. Even though it was less than four miles to the finish, it certainly didn’t feel like the home stretch. There was still one more climb to overcome. At the top of that climb, I decided I had to pee. Unfortunately, I put things away a bit too early and leaked a bit in my shorts. I was close to the finish and I didn’t want to show up there looking like I had just pissed myself. I’m blaming my sleep deprived brain and exhausted body for this, but it seemed to me at the time that the best course of action to hide the fact that I peed myself would be to spray some water from my water bottle on my shorts. Soon after, I realized what a mistake this was. My severely chafed inner thighs and testicles were screaming with every step once the were wet again. At the finish being helped across by my boys! I continued on to the final and crazy steep descent. It seemed like I could hear cheering from the finish line crowd for several miles. My quads burned and threatened to completely give out as I tried to descend the last stretch with some sense of control. My feet hurt so bad and my quads were so trashed that I was grabbing trees along the trail to help myself brake. Finally, the trail led out to a parking lot where I could see the finish line. I made it to the grassy field and my boys met me shortly before the finish line to run under the blow up arch with me. And there was David Walker (race director) waiting to greet me. He presented me with the finisher’s buckle, which I was most appreciative of. Having now finished two of the races he directs, I can say with confidence that those races were the most orderly and well organized ultras in which I have ever partaken. I can also say that I think he may be a bit of a sadist. 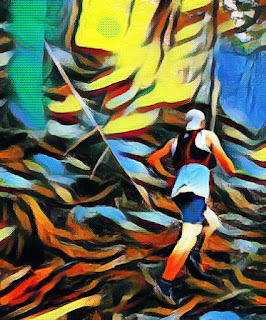 At both Worlds End and Eastern States the courses end with a super gnarly and steep descent for your trashed quads to contend with. And at both finish lines he asked me with a huge grin how I liked that final descent. Seriously though, he is an excellent race director and a great guy. From my experience at both races, I watched him stay near the finish line the entire time and congratulate every runner as they finished. Just after the finish with race director, David Walker. 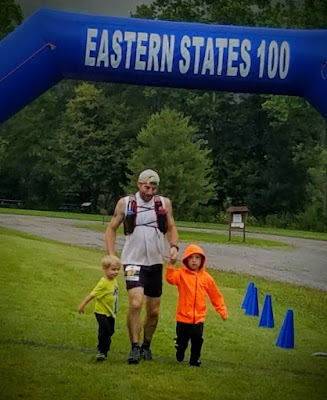 Having my wife and kids waiting for me at the finish of the toughest race I had ever done which also marked the completion of the PA Triple Crown Series, my primary goal for nearly two years, I thought I may get a bit emotional or teary when it was complete. I mostly just felt relieved that I had hung on for the last 15 miles or so that tested me to finish in tenth place with a time of 27:17:24. I was also super ecstatic about how well the first 85 miles went. This race proved to me that my performance at my first 100 miler wasn’t just a fluke. It got that annoying pessimistic voice to finally shut the hell up. It also reinforced the lesson that I should have learned at Worlds End: that preventative maintenance of your feet is not an option. 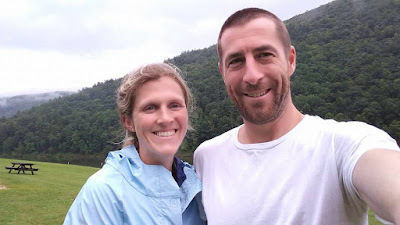 Aside from everything that was great about the race and everything that went so well for me, I was also so grateful that this initial family camping trip went so smoothly for my wife while I was out running all night. The kids had a good time outdoors without any YouTube videos or Minecraft, my wife enjoyed having time with them without the distractions, and I got to run a long time and have them waiting for me at the finish. While making the drive back to NJ, we all agreed that it was a trip worth making again. Just the thought of that makes me smile and want to visit Ultrasignup.